If Macy lives in the middle of nowhere, and she’s being told that the key to success is to go to a well known school in a big city and work hard. Her family makes $75k a year supporting a household of 4. They can’t afford a big city school, but once again, they’re told that the key to Macy’s success is that big city school. So the school, with all its degree offerings, gives Macy $40k a year, which covers 2/3 of the school’s $60k per year cost of living. She takes out a loan for $20k and her parents provide her with $7k throughout the academic year for every day expenses. She does this for the next three years, coming out of school with $80k in debt. She realizes that after those four years, she wants to work in publishing, which makes on average$40k a year– that’s before taxes. Marcy believes this is her calling, but it won’t help her repay her $80k debt, which will grow because of principle and interest. In addition to paying back her debt, she’d like to go out with friends occasionally, take a vacation once every two years, manage the cost of living and save for her future family. It’s a lot she wants to do with a starting salary of $40k, but she hopes to grow in her career. She can make upwards of 75k per year in the next 15 years. She’s willing to take on the stress of her goals but $80k-and-growing-debt is too much stress with her level of income. She may not be able to go on vacation, rent an apartment or buy a used car because of the bad credit she incurred because her loans will bring her credit score down. Some might say she should have gone to a local, low-cost college, but that local, low-cost college wouldn’t have got her the job she wants at a publishing company that will pay $40k a year. In order for Macy to find herself, she has to go to college. She realized she wants to work in publishing, earning $40k a year, but if it costs her $80k to land her dream job, it’s not a sound investment, and I guess, that’s Macy’s fault. The problem with higher education is that low and middle income families who are taking on tens of thousands of dollars in student loans can’t major in anything or go to any school. In order to manage the financial burden, they must trade in what they want to do (which may pay less) for something that they may not be passionate about but pays more. The cost of college today makes it impossible for graduates, who are interested in a not so lucrative career path, to succeed. I’m still reading Most Likely to Succeed by Ted Dintersmith and Tony Wagner. The book has a chapter that focuses on college and its role in education as a whole. One of the subtopics that I found most relevant but not widely discussed is higher-education’s negative impact on the income inequality gap. The high cost of college and the lack of effective career-readiness training leaves college graduates with little to moderate skills and tens of thousands of dollars in debt. What’s a philosophy major to do when he didn’t realize that he doesn’t know how to market his philosophy degree to nonphilosophy-related employers? What’s a philosophy major to do when all he focused on for the last three semesters was writing philosophy papers, reading hundreds of pages worth of philosophy material each week and working a part-time job as a barista but failed to realize there isn’t a sustainable philosophy career path that doesn’t require him to add onto his five figure debt? provide internship opportunities to students while they are attending school, so that students can test those learned skills colleges claim they help students hone. Generally speaking, college students areyou’d adults who may name have the support and (both emotional and financial) to make decisions that would truly benefit them in the long run. We’re told a college degree will benefit students, but what’s so beneficial about working a non skilled job at a wage that can barely begin to pay off the student incurred during ones college career? What’s so great about being in debt for the rest of your life and not doing what you love, say expanding on philosophical theorys, because you need a job that will allow you to start paying off the lifetime of debt, live and save for the future? How is it fair that we tell our kids that a college degree is a great accomplishment that will make them successful but we don’t clarify which degrees have the potential to alleviate some of the financial burden that schools leave you with? Students aren’t informed about what their potential employers are looking for in a candidate and therefore can’t act accordingly. What is happening in colleges that students can’t find jobs that can help them both follow their passion and survive? I think colleges aren’t realistic about job prospects for their many degrees. Schools spend so much time and effort to get students to go to their institutions, pay their high tuition and fees, but don’t really help students make sound decisions about what to do with their degrees. We live in a society that thinks it’s okay for schools to boast about their hundreds of degree offerings and not warn kids about how it makes no financial (as opposed to social) sense to study most of them, if the student is expecting a financial return on their education investment. Colleges must do more to assist students on the real value of their degree and debt realities. If they don’t, colleges will only continue to deeper the income inequality gap. For institutions that claim to be a positive force in society, it be wrong to say that further, more thoughtful and more individualized development is not their problem. Folks who think that this kind of development should not fall on colleges’ laps probably also see nothing wrong with for-profit schools. Wouldn’t it be nice for schools to adjust tuition based on a students projected income?…I need to think this out some more. I’m also trying to reimagine the role of the professor. Should professors be vocal about career prospects when they are in direct conversation with the folks who are using their field of expertise, as a starting point? More on that in a later post. Slowly reading through Most Likely to Succeed and came across a point similar to something I argued in a post I wrote two years ago. I made the argument that students should take at least one thorough economics course in high school. Thinking back on it, I think every high school student should take at least two economics courses, but I digress. 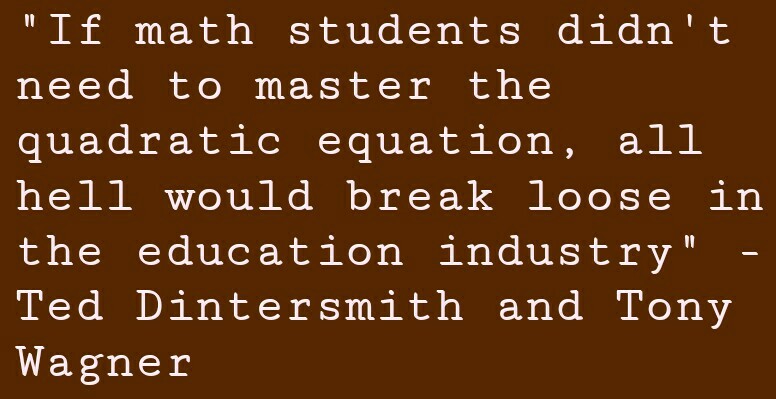 Ted Dintersmith and Tony Wagner expand on the-necessary-courses-in-high-school-debate by saying that it is more imperative, useful and practical to take finance literacy and civics courses, than it is to take years of, say, Earth Science. The point I was trying to make then, and the point they’re trying to make now, is that these courses actually speak to our goal of making students better citizens. We get lost in the need to make young adults “college ready” that we forget to make them informed citizens. These courses, more than me struggling my way through Spanish from 7th grade until my sophomore year of college, would prove to be far more beneficial. Without speaking Spanish, I’ve managed to become a college graduate with a great job, but I’m also trying relearn both the election process and prepare my taxes for the upcoming tax season. I was taught the election process during a couple of lesson plans in both middle school and high school but quickly forgot it after everything else I studied since then. I never learned much about taxes (except for the fact that we all must pay them!). I went to a good college in New York City and the only thing we had close to a financial literacy class was 2 hour-long financial literacy lectures at the end of my senior year, when I was working hard to graduate with a high GPA. It should have been a required course that one takes in your Junior or Senior year. I’m reading other ed policy content and have a little less than 2/3 of the book to read. But, so far, if I’ve taken anything away from this book, it’s that high schools and colleges need to care more about economics, financial literacy and civics. These educational institutions are currently doing a gross injustice against their students. The point I was trying to make then, and the point they’re trying to make now, is that these courses actually speak to our goal of making students better citizens. We get lost in the need to make young adults “college ready” that we forget to make them informed citizens. These courses, more than me struggling my way through Spanish from 7th grade until my sophomore year of college, would prove to be far more beneficial. Without speaking Spanish, I’ve managed to become a college graduate with a great job, but I’m also trying relearn both the election process and prepare my taxes for the upcoming tax season. I was taught the election process during a couple of lesson plans in both middle school and high school but quickly forgot it after everything else I studied since then. I never learned about taxes (except for the fact that we all must pay them!). I went to a good college in New York City and the only thing we had close to a financial literacy class was 2 hour-long financial literacy lectures at the end of my senior year, when I was working hard to graduate with a high GPA. It should have been a required course that you take an your Junior or Senior year. I’m reading other ed policy content and have a little less than 2/3 of the book to read. But, so far, if I’ve taken anything away from this books, it’s that high schools and colleges need care more about economics, financial literacy and civics. These educational institutions are currently doing a gross injustice against their students. I didn’t take a statistics class in college but think I will take a course in Fall 2016. Hopefully this will help with ed policy grad school applications, but I’ll need it for Ed Policy-related research I’d like to do, regardless if I apply to graduate or not. One thing I like about Most Likely to Succeed is the authors’ challenging of some the traditional yet mudane requirements of school, particularly high school curriculum. Students spend countless hours, days and/ weeks, trying to memorize hundreds of words and solve complex and complicated math problems for the SAT. Colleges think that this is a testimony of how successful a studnet would be at their institution. College Board and colleges pay no mind to whether the information is useful or not. I think it maybe good for some students, who want and like that level of technical knowledge because, perhaps they want to pursue a career as a mathematician. But, for someone like me, I hated my pre-calculus class. Generally speaking, I never cared too much for math and while I think students should be exposed to all that is out their, I would have preferred to have not been judged by my inability to command something-a-little-more-than-basic-level geometry and algebra. I majored in English, loved my Economics and Theology courses and wrote for my school’s newspaper. I read 2-3 books a month and read countless articles in that time period. I hardly (if ever) use anything beyond simple equations. My livelihood doesn’t depend on anything beyond that. I’d like to go to graduate school for Ed Policy, so I’m studying for the GRE studying. The math portion is very similar to tge SAT. GRE I’ve looked at some of the content to cover in preparation for the SAT, and all I do is look as the words o problems and think to myself, “Oh, that looks familiar.” But I couldn’t recall any of it…I hadn’t used it since high school (my college required one math or computer science class; I opted for the near mathless computer science class). I’m happy with my non math-related job, a feeling I didn’t feel when I was forcing myself to remeber the volume of a cylinder, which is V = Pi(r^2)(h). 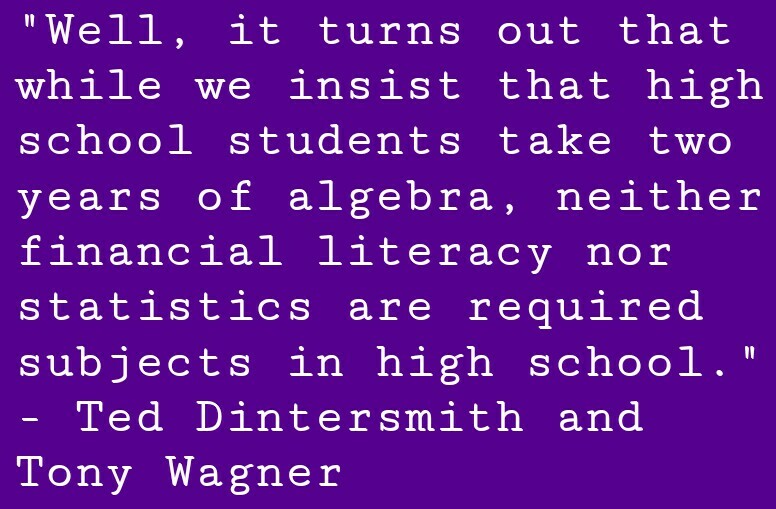 Dintersmith and Wagner try to re-imagine the time spent on complex math problems and needless never-used-again SAT words. If could have taken a tested my mastery if the most necessary math skills, while challenging my well rounded and well-read reading and writing abilities, I think I would’ve been a better individual. “Does TFA believe that a recent college graduate with five weeks of training should be responsible for children with disabilities? Do they think no special training is necessary? Are they saying that people who earn an M.A. or a doctorate in special education have wasted their time? You don’t realize how self-involved a organization can be until they spend at least a half a million dollars to ignore some of their most hurtful and obvious flaws. Diane’s questions highlight TFA’s undeniable damage by weaving their ill-prepared, yet well known, way of “training” their mostly temporary teachers into her poignant questions. Wendy Kopp is aware of what her organization is doing. She’s just selfish and doesn’t want to accept the fact that her organization does more harm than good. TFA seemed like a great idea and it was started based on what I believe to be good intentions, but those intentions are no longer good. TFA’s leadership is holding onto pride, control, power, money and a disgusting ego.